History of Masonry Mortar in America 1720-1995 documents the last 275 years of the evolution of ingredients. The book assists architects and builders in modern times to match mortar formulations when they are engaged in work that requires authentic replication of original material for the restoration of historic masonry buildings. Available through Technical Preservation Services, National Park Service, U. S. Department of the Interior.
.: Historic Masonry Preservation :. 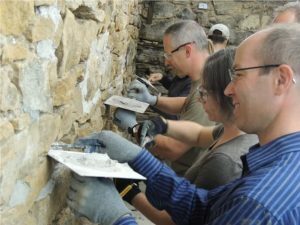 Join us on September 15 & 16, 2018 to learn all about Historic Masonry Preservation. CARTHALITE PRESERVATION Minisa 13th Street Bridge, Wichita, Kan Rehabilitation of the Minisa 13th Street bridge in the heart of Wichita Kansas was a community undertaking that entailed the efforts of many dedicated people, contractors, agencies and even the governments of foreign countries. Part engineering part artistic sculpture, no where in the Midwest is there such a work of incredible art in the form of an ordinary bridge. The restoration effort spanned four years and several million dollars. Read what it took to do the job right – the first time! The book is the actual job log taking you step-by-step into the progress meetings, contractors challenges and mis-matches and mistakes that were corrected along the way to make this rehabilitation project the one that earned the coveted Kansas State’s Engineers Award in 2008.